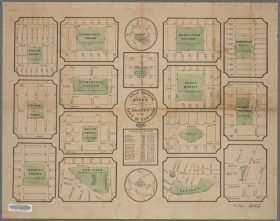 “Public squares, parks, and places in the City of New York.” Via NYPL Digital Collections. Built to emulate Great Britain’s enviable squares, which were actually square, Manhattan’s public squares were created in the celebrated New York City tradition of being whatever they pleased–and definitely not square. According to the New York Daily News, Manhattan doesn’t have any actual squares at all: Lisa Keller, executive editor of the Encyclopedia of New York City, said “Americans just call it a square if it’s bigger than a breadbox.” But those 40 squares from Madison to Foley, Herald and Greeley have been vital in defining the city’s public spaces; they were its first parks, and a predecessor to the granddaddy of all squares, Central Park. 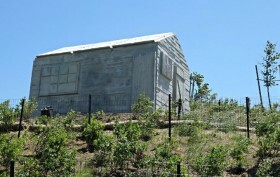 The beautiful hills of Governors Island has a new sculpture by British artist Rachel Whiteread, and it is yours to discover through the entire season. Bring a tote or a T and get a custom screen print by Brian Leo, or head to GHOST art lounge to talk all things about artists JMR and CRASH. Head outdoors for a day time dance party at MoMA PS1, for a French film at Tompkins Square Park or to the gorgeous Morris-Jumel Mansion for live art and jazz. Celebrate sound at Pioneer Works, or if you’re feeling adventurous; hop a train to Asbury Park for sun, surf and the Art Star Craft Bazaar. New York City is often referred to as a concrete jungle, but that doesn’t mean it’s 100-percent void of vegetation. Throughout the city you’ll find beautiful pockets of lush city parks that often have a special history of their own. 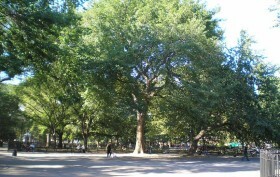 Tompkins Square Park for example is home to the Hare Krishna tree and the birthplace of this modern religion. There’s a charming apartment available in Ageloff Towers now going for $725,000. This pre-war pad features modern amenities against the backdrop of original details like beamed ceilings, parquet floors, base molding and wainscoting. 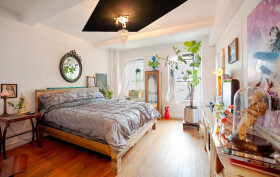 Generously sized for a one-bedroom, this unit is perfect for a young New Yorker looking to create a cozy home in one of the city’s most culturally distinct neighborhoods.